This rates as one of the handiest things I’ve seen in a while (okay I’m a geek). Say you feel like brushing up on some new Microsoft server/application – so you set up a VirtualPC and play with it there. Microsoft’s Virtual Labs have made this much much easier by setting up test environments for you which you can access via a web browser. 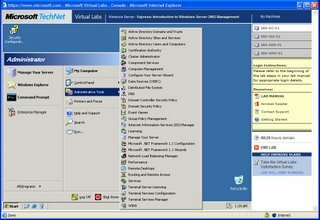 I had a play with the “Introduction to Windows Server 2003 Management” tutorial – which allows you to switch between the four PCs being “virtualized” for the tutorial (domain controller, workstation, etc). It looks like it all works around virtual servers hosted in Microsoft Virtual Server. 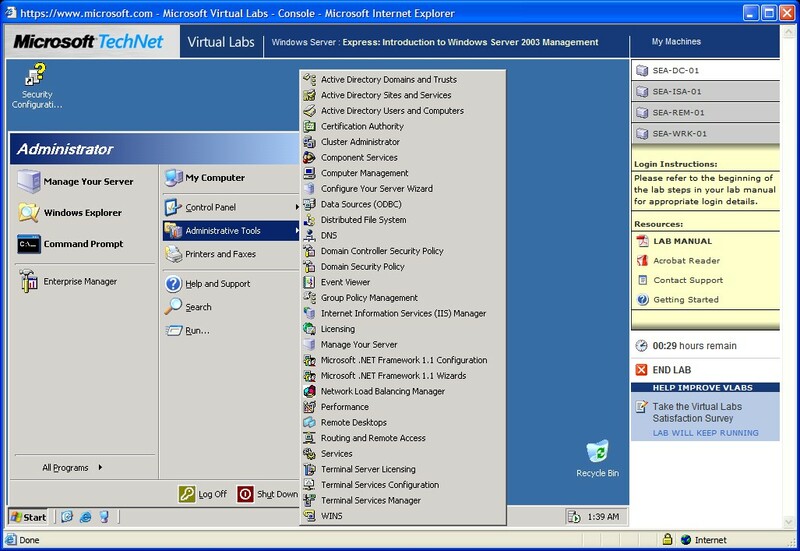 Virtual servers can be viewed over the network via the ‘Virtual Machine Remote Control’ ActiveX control. You can view a virtual server which has it network connection intentionally “restricted” – something you couldn’t do with Remote Desktop. Thinking of hosting CruiseControl.net inside a virtual server at home – and adding a page to the CruiseControl webapplication with the VMRC ActiveX to jump onto the server. Microsoft Virtual Server is now a free download. As are two VMWare products: Player and Server. VMWare also provide a directory of “pre-installed” virtual machines: Virtual Appliances. Looks like a very easy way to check out a Linux distro. Posted by russ on Sunday, April 23, 2006, at 1:09 pm. Filed under virtualization. Follow any responses to this post with its comments RSS feed. You can post a comment or trackback from your blog.